Every two weeks, Big Issues focuses on a newly released comic book of significance. 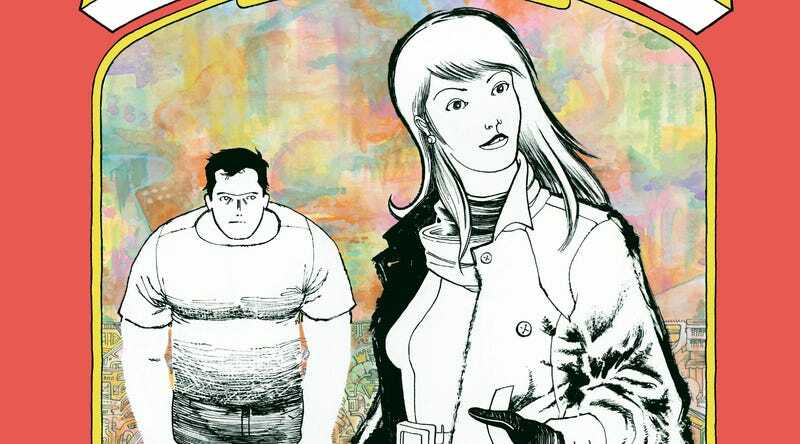 This week, it’s Zegas, a graphic novel by Michel Fiffe (COPRA, All-New Ultimates) that pairs ambitious, unorthodox visuals with intimate character storytelling. Fiffe uses Boston and Emily to explore the challenges of the artist’s lifestyle—both emotional and financial—and even if these characters don’t explicitly reflect his views, there’s an undeniable personal connection when an artist is addressing art in their work. It’s also something younger artists tend to struggle with as they discover the reality of their industry, and Zegas feels like an early work for Fiffe. But that doesn’t make it lesser. The work here is still very refined compared to the vast majority of comics out there, and there’s a lot of passion and excitement in these pages. Fiffe’s not set in one specific mode, but exploring the vast creative opportunities of both the medium and his concept. The major fun of Zegas is seeing Fiffe try out new techniques, not just with structure, but with linework and coloring. There’s a real sense of discovery here, and Fiffe’s impulses often lead to insights. Much of the color in Zegas comes from paint or colored pencils, but “Plum” is colored exclusively with screentones, highlighting how these patterns add texture to the artwork. The first story, “Birthday” (previewed here), sets the bar very high for the rest of the book, establishing Emily and Boston’s tense but loving relationship, the surreal surroundings, and Fiffe’s unique way of approaching emotional, character-driven narratives. Fiffe makes the comic page feel like a three-dimensional space in how he layers panels and lettering, and small details have a big affect on this illusion. Emily throws an ice cube at her brother and it bounces off a cabinet, flying out of the panel and into the next, which doesn’t have a border up top so it appears to be behind the first panel. (The lettering of the first panel also overlaps with the second, reinforcing that overlap.) Those three planes—the house, Boston, and Emily, the ice cube—add depth to the entire page, subtly telling the reader to start considering the layouts in three-dimension rather than two. I touched on this topic in my Big Issues on Santiago García and David Rubín’s Beowulf, which is much flashier with how it arranges panels to suggest a three-dimensional space. That added drama is appropriate given the legendary subject matter, but what makes Fiffe’s layouts so remarkable is the subtlety and grace of the execution. At the bottom of the ice cube page, there’s a three-panel sequence showing a lightning bolt shooting through the sky. It emerges from the corner of the first panel, travels above the first gutter, then goes behind the second. Fiffe could have depicted this sequence in a single shot, but breaking it into three panels and having the lightning bolt travel through them creates a strong sense of motion, not just from left to right, but from front to back. The most dramatic moment of Zegas comes during “Looking For A Perfect Beat, Part One” when a big-shot DJ takes the stage at a nightclub. The reader doesn’t see him as his set begins, but the sound seeps into the scene as a wave of pink and teal washes over the panels. Borders begin to disappear as the volume builds, and the two-page spread that follows brings an explosion of visual noise when Fiffe reveals the DJ and his crew. Thick horizontal brush strokes evoke the aggressive blast of the music, and Fiffe uses different planes of action to intensify the impact of spread. Straight lines break through borders and curve through multiple panels, and a giant hand emerges from the bottom of the page and travels through two panels on its way to the top image. The trail of beads falling onto the panel below gives the end of the hand a different position on the page than the base, which goes under a gutter rather than over. Once again, Fiffe is evoking movement from left to right as well as back to front, and putting the hand above everything else is a brilliant way of depicting the DJ’s grip on the crowd. Not every story in Zegas has this level of visual experimentation, and Fiffe recognizes that while some situations benefit from unconventional design and structural techniques, others will be more effective by sticking to the basics. Having set panel layouts on a 2-D grid can help situate readers in a scene, as they do with Emily’s workplace in “Arcade,” or accentuate the emotional beats of a conversation, as they do with Boston and Stefan in “Looking For A Perfect Beat, Part Two.” That bus chat takes place over three pages, two on a 3x4 grid, one on a 5x4 grid, and Fiffe uses only four angles for the 44 panels: a side-view, over-the-shoulder shots for both men, and a close-up on Boston. The most important thing about this sequence is the expressions, and having a set framework for the angles and the layout allows Fiffe to focus on how these characters are relating to each other in the individual panels. With 44 panels, that’s a lot of reactions, and switching between angles is how Fiffe adds dynamics to the dialogue. Sometimes he’s showing how the two men are responding to each other in the same image, sometimes he’s emphasizing one person over the other, but still keeping both men in the frame. Boston is ultimately the main figure here, though, and he’s the only one who gets a close-up. The end of Zegas promises more stories with these characters, but maybe they belong in Fiffe’s past. He’s an artist who is always moving forward, and new projects provide fresh challenges that inspire bold solutions. Next year, Fiffe will be reviving Rob Liefeld’s Bloodstrike for Image Comics, and the vague announcement in October suggests that he’ll be handling this book on his own. Fiffe has worked on preexisting superhero characters in the past, namely as the writer of Marvel’s All-New Ultimates, but he does his strongest work when he’s able to visually interpret his ideas. Books like Glory and Prophet revealed the greater potential of Liefeld creations, and Fiffe is an inspired choice for Liefeld’s team of extreme heroes. Fiffe’s Copra is very much rooted in superhero comics of the ’80s, and Bloodstrike gives him the chance to explore ’90s superhero storytelling, which prioritized attitude and action above all else. How will those elements affect Fiffe’s avant-garde perspective? It won’t be long until readers find out, and given Fiffe’s ongoing evolution, Bloodstrike could break new ground for superhero comics.